UPDATE: From November 2015, Microsoft announced it will stop the Camera Roll Promotion along with the option of paid, unlimited OneDrive storage, Paul Thurrott notes on his blog. These changes started coming into effect early 2016 according to Microsoft's OneDrive FAQ found here. Microsoft, in an effort to bolster their online suite of online productivity tools, gives anyone with a Windows Live account 15GB of OneDrive cloud storage for free. That's right: 15 Gigabytes of online storage for any files (documents, videos, pictures, etc.) for free. You can even double this amount of OneDrive online storage size to 30GB by using Microsoft’s “camera roll backup bonus” feature with your Apple, Android, or Windows smartphone or tablet. I'm here to show you how. 1.) The best part about this free OneDrive storage is you don't even need to own a copy of Windows to take advantage of it. All that is needed is a Windows Live account. You may already have an account if you have an Outlook.com or Xbox Live account. In the event you may not, you can make a free Windows Live account by going here and clicking either signup link on the page. Click on either of these links to create your free Windows Live account. 2.) You will be taken to a Windows Live account creation page. Fill out the form on this page to obtain a free account. Note: during the signup process, you can create an Outlook.com email account or use an email account from a different service (such as Gmail or Yahoo! Mail). This email will be your Windows Live account username that you will use to sign in to any Windows Live service. I prefer to use my personal email account for Windows Live so I don’t need to keep up with yet another email inbox! If you use a personal email account, you will need to verify you own the email account through a verification email Microsoft will send when you first log in to your Windows Live account. 3.) 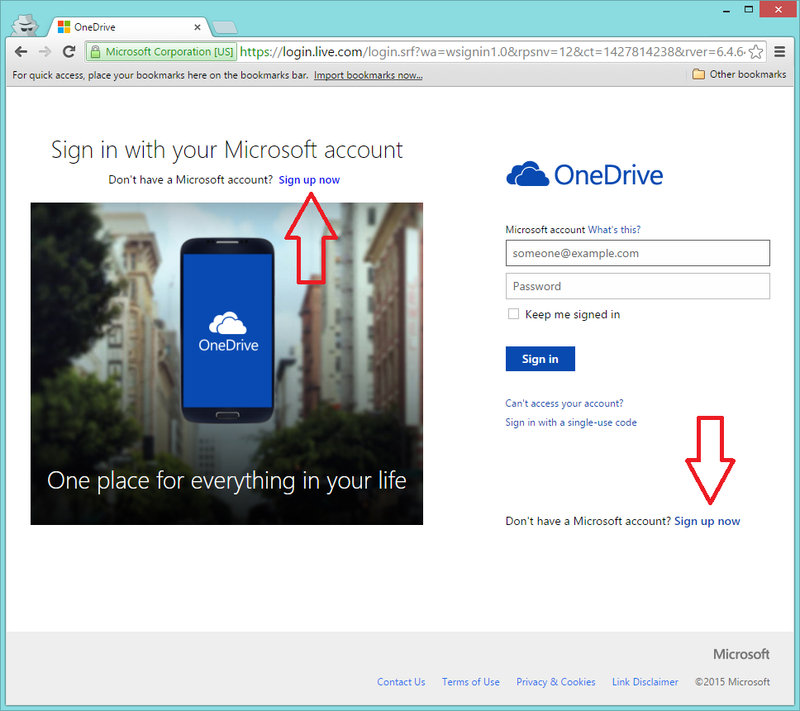 Once a Windows Live account is created, you will be able to view your OneDrive storage by signing in using your newly-created account at https://onedrive.live.com/. On the initial page after login, you’ll see that you have 15GB of OneDrive cloud storage available. We don’t want to stop there, however. I promised 30GB of OneDrive storage. 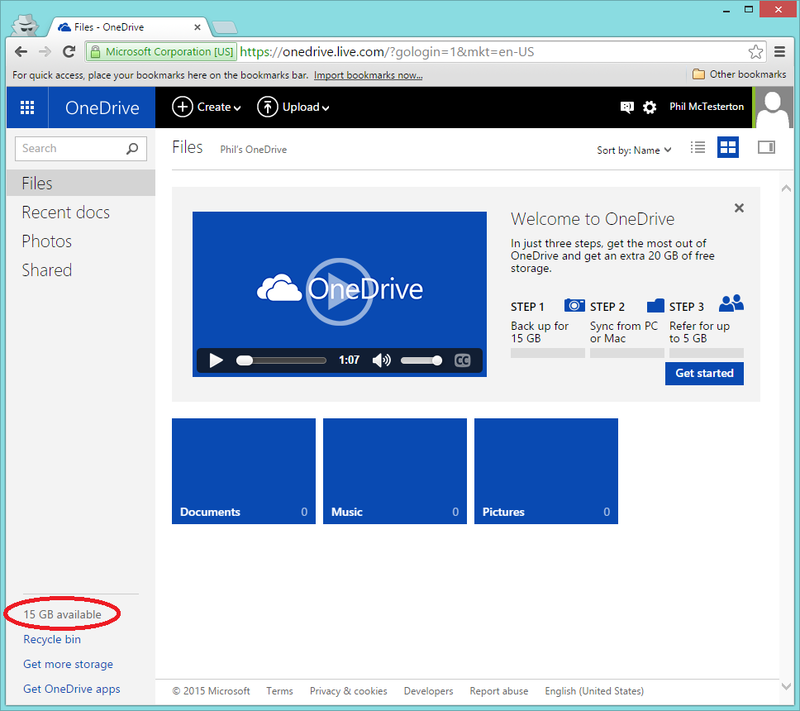 (Optional Step) You can also find these same links by clicking the “Get started” button on your OneDrive web page. Click on one of appstore boxes that apply to your mobile platform of choice. Click the "Get Started" button to claim your extra 15GB of storage. Click the download button for your mobile platform (Windows Phone, iOS, or Android). 5.) Once you download and install the OneDrive App, go ahead and open it on your device. For this example, I am using my iPad to continue the process. When the app is initially opened, you’ll be prompted to sign in to your Microsoft Live account. 6.) After you sign in using the app, a prompt will come up asking if you want to activate the Camera Backup feature and receive an extra 15GB of storage on your OneDrive account. Tap “Turn On” to activate this feature. 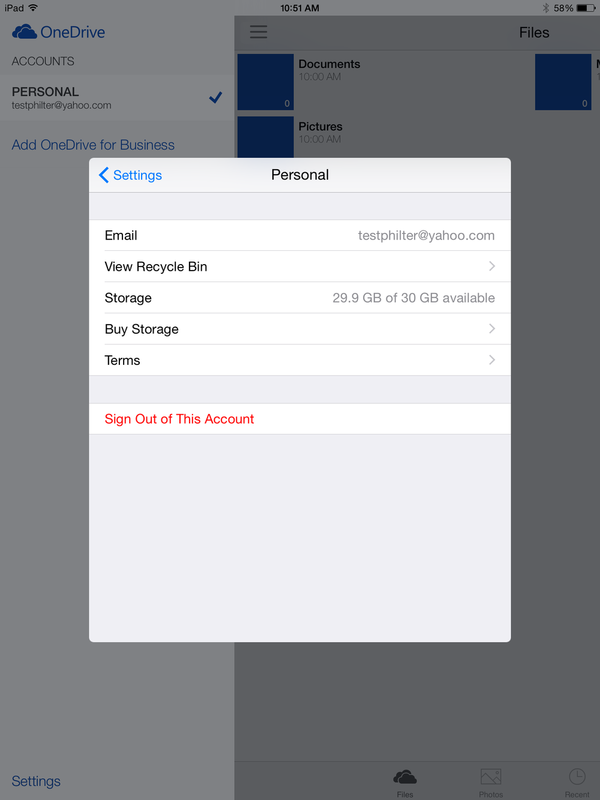 Tap "Turn On" to receive an extra 15GB of OneDrive cloud storage. 7.) Once the feature is activated, you will be able to see that your OneDrive cloud storage has jumped to 30GB by visiting the settings of the OneDrive app or refreshing your https://onedrive.live.com/ web page. 30GB of OneDrive cloud storage is now available. That’s it! You now have 30GB of online storage for free from Microsoft for just a few minutes of work. There are many cloud storage options out there, and this is just one of them. I find myself constantly informing people of these free options which is why I made this quick tutorial. I believe this article will be especially useful to iOS users. Apple provides a default of 5GB iCloud storage for free, but then requires a monthly subscription for anything over that amount. Every iOS user I’ve encountered (including myself) has hit the 5GB limit due to the number of apps, photos, and videos that are backed up. This article is to help lighten that burden. What if you don’t want to backup your camera roll using OneDrive, but still want the storage? If you have multiple mobile devices (such as a smartphone and a tablet), turn on camera roll backup through the OneDrive app on the device you don’t often use to take pictures. For example, I have both an Android smartphone and an iPad. I almost exclusively use my Android phone to take pictures, and since I already use Google+/GoogleDrive to automatically backup all of my photos (I will have a separate how-to article on this later), I don’t need to have my photos backed up to OneDrive as well. I can use that OneDrive cloud storage for something else. In this case, I just sign in to my Windows Live account on my iPad and turn on camera roll backup, but decline to turn camera roll backup on through my phone. You will still get the bonus storage either way. Have additional questions, comments, corrections, or suggestions? Let me know in the comments down below or on one of the various social media outlets I’m a part of. If you found this article useful and want to see more like it, please like and share using the buttons below to get the word out. An updated start menu combining both Windows 7 and Windows 8 "Modern UI" elements (pictured above). It's gotten to the point in Windows 8 where I don't ever use the Windows key anymore, and dread the moment when I accidentally press it since I'm jolted out of my desktop view into the Modern UI view which I hardly ever use. Running Modern UI apps in a windowed mode on the desktop. I use a couple of Modern UI apps when I need to, but it becomes annoying as I need to also work with traditional desktop applications at the same time. Try switching quickly between a Modern UI app and a desktop app. It's annoying. Virtual desktops. Finally Microsoft is joining the virtual desktop crowd and adding it in to, at least, the technical preview of Windows. I first understood and learned the necessity of virtual desktops under various flavors of Linux, and when Apple eventually implemented the functionality into OS X I wondered how I got by without it on my Mac. Now I can't wait for the next version of Windows to come soon enough! Paul makes a note that "There is no Windows codename or version number listed." This can imply that the next version of Windows, as previously rumored, will just be called "Windows" and not "Windows 9" or something else. It's also important to note that, since this is a technical preview, some UI elements may be changed before the final release of the next version of Windows. With an expected ship date of April, 2015, a lot of changes can still be made.